This is a post about fashion, that’s actually about not giving up. 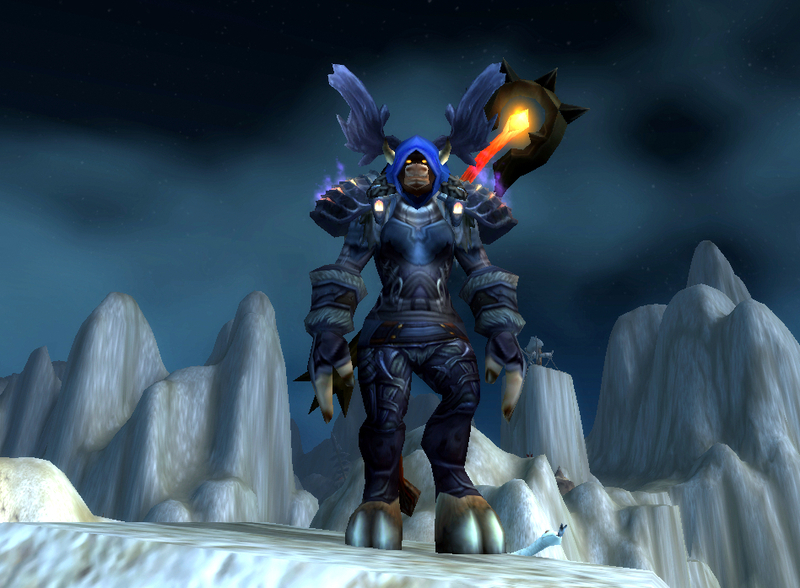 Back in March of 2012, I drafted a post about transmogging my main, Normanitee. This is how it started. Here is a confession. When they introduced Transmogrification, Norm did nothing about it. I didn’t collect a single piece of gear, I didn’t go on a single retro run. I didn’t design any outfits on Wowhead or wonder what she would wear. I already knew, and it was already in her bank, still gemmed and enchanted. For my Normanitee, transmogrification wasn’t an opportunity to explore new and creative ways of dressing or expressing her personality, but a chance to finally wear the outfit she’s always worn in my mind. This sounds like a introduction full of confidence, but here’s the dirty secret – I didn’t do anything else on Norm, either. I didn’t play my druid. She was in a guild that was a poor fit, and I’d been playing alliance alts on a casual basis for well over a year. Norm started off 4.3 still wearing 346 blues from pre-T11 raiding, with no achievements to her name. I could barely remember how this new style of druid healing worked. She was undergeared, unloved, and very much alone, despite me, Narci, having more wow-playing friends than ever due to this amazing blogging community. 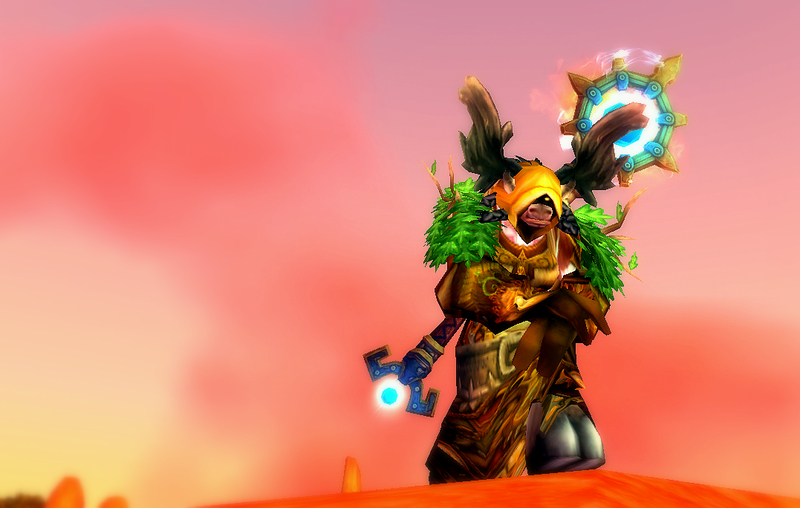 I transmogged her into a druidic outfit from Ulduar that represented to me what she was when I was raiding 25 hardmodes. She was very much exclusively a healer, playing in the background, in a large team. I had lots of time to devote to playing her. 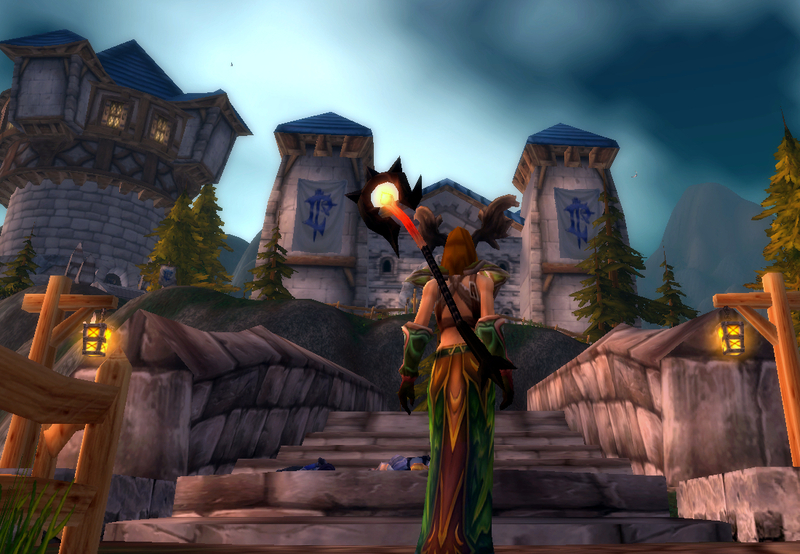 I still feel lot of love and loss for the guilds I belonged to during Lich King. This was the iconic screenshot of Norm. 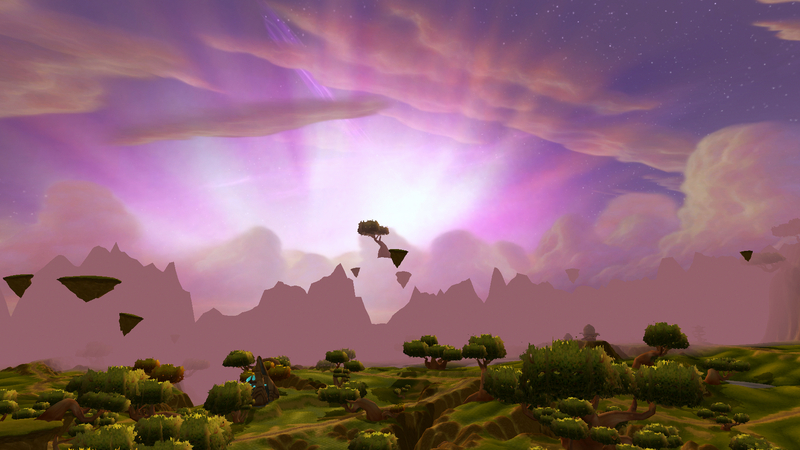 It was taken on an incredibly high population realm so late that Orgrimmar was empty. Night had definitely become morning, as the sunrise came up over the red cliffs and filtered through the growing orange of the dusty skies of Durotan. My guild had killed Onyxia for the first time, back in T9, and we were all high on boss-kill adrenaline. Norm dumped all her DKP, and was instantly in love with her Moose Ears. Hours had passed on vent, running around a rock, talking to the tank who was to become my partner in wow, and then my partner in life. I had to log off to go to work, too hyped up to even feel sleepy. This picture was my desktop background for years. I hadn’t realized that nothing about it was who she was, or who I was, anymore. 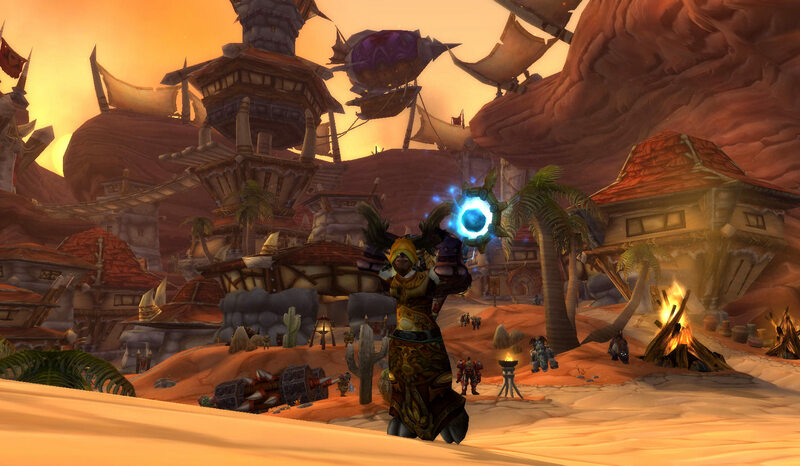 Transmog allowed me to recapture a time when she felt very much herself, very much at the height of her power, and at the height of my satisfaction in game. She no longer looked out at me on the loading screen, her clashing horrible heroic gear berating me for giving up on her. I hadn’t forgiven myself for giving up setting goals and accomplishing difficult things in game. I had never stopped loving Norm, but I was afraid, perhaps, that she had stopped loving me. I found myself able to log back in. I stopped making excuses and transferred her to a new home. I started doing heroics again, then LFR, then guild raids, heroic bossses, pvping, collecting achievement points, setting foot into an arena for the first time. Her back story had been stuck in limbo since the Shattering, a broken, retired burned out soldier, with no new stories to tell, only memories. It opened up before me, behind me, all around me, with the inspiration of a few good friends. Somewhere, I realized I didn’t need Norm to be who she was in 2009. She could be Norm, who she, and I, am right now. Even if that’s not who I expected to become. “Haha, I should make some kind of Darkmoose Anti-Druid Fake Rogue outfit out of this hat!,” I laughed, while digging through my overflowing bank, and playing with vanity items with Rades, late one night shortly after I transferred. Before I knew it, I had most of an outfit thrown together, and to my surprise, it felt right to wear it. 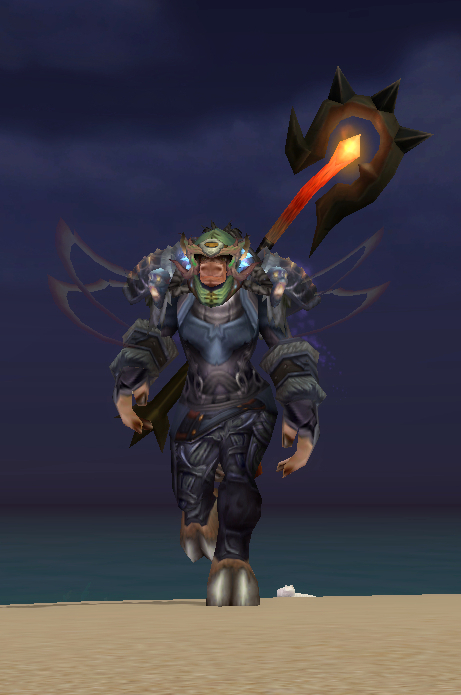 To be silly, to be completely different, to wear something unique that didn’t look like druid gear, to invert Norm’s moose antlers to become the dread DARKMOOSE. It’s a drastic change of pace from the swirly green mixed tier Norm typically wears for PvE healing, with it’s many straps and buckles, fur trim and rivets, all in black and grey. It reminds me that PvP is a different beast, and even the best druids will have to do as needs must when their faction calls them. It reminds me to be flexible on the field, and not get stuck into a healing rut, as if I were in a raid. I am not only a channeller of nature’s healing bounty, but also a stealthy cat, a sprinting cheetah, a durable bear. Able to be a knife-like surprise, sharp and unexpected, like the shoulders. Not just a healer, but truly a druid. It’s also gotten me over a long standing distaste for Norm’s knees. What is it with knees in this game? See, check out those visible knees! Norm has decided that Moose Hats are her signature piece, and gets cranky when I ask her to wear anything else. Fortunately, there are Moose Hats in yellow (the druid-only T2 StormrageCovers ), navy and black (the Druidic Helmet of Second Sight), and blue and oak brown (the Moon-Crown Antlers). Moose hats are nice because it’s always easy to spot myself in a crowd, both from a fashion standpoint, and from a game mechanics stand point. I find it entertaining that she has this dark, stealthy outfit, but is still brash enough, and druidic enough, to put antlers on top of it. I enjoy having a signature piece, even though I’m not sure it was exactly voluntary. Norm is a cow with opinions. This outfit is difficult to capture in screenshots, because both the staff and the shoulders have brief, unpredictable animations that radically change the outfit. The staff’s central ember spins and pulses, and the head occasionally emits crackles of lightning. The shoulders are a recolor of Rogue T8. The pauldrons send out a trio of glowing orange claws which whip around the body incredibly quickly. They trigger every time you change forms, so they’re especially exciting when I’m popping in and out of flight form for archaeology. Of course, every screenshot I’ve managed to catch of them in action is totally unusable for fashion reasons. 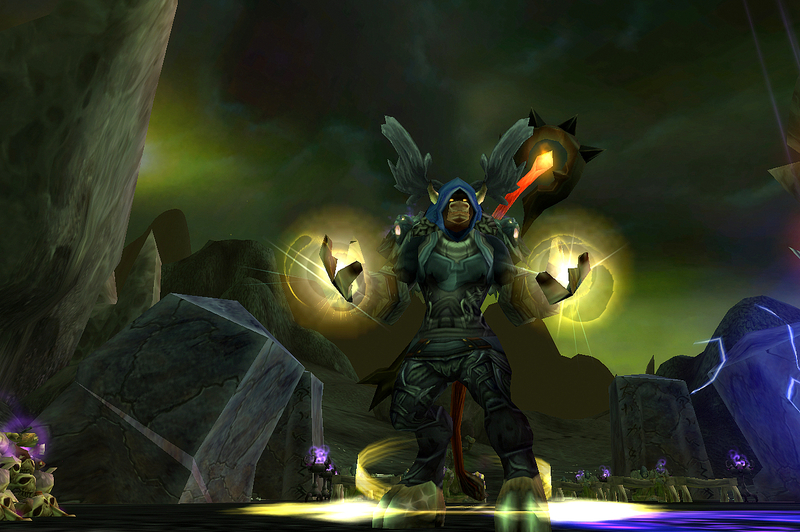 Check them out in the 3D on Wowhead to really see what I mean. The Bloodfire Greatstaff is one of those iconic pieces that I rarely see anyone wearing – I get occasional whispers from mogmaxing admirers over it. I love carrying a giant flaming iron brand Horde symbol onto the battlefield. I love thwacking totems with a mighty 8 foot smoldering pole. Pretty sure your disguise isn’t fooling anyone, Norm. The set requires a leatherwearer of at least level 80 with access to Ulduar for the shoulders and hands. The rest of the pieces require level 70 and are mostly from BC Heroics. 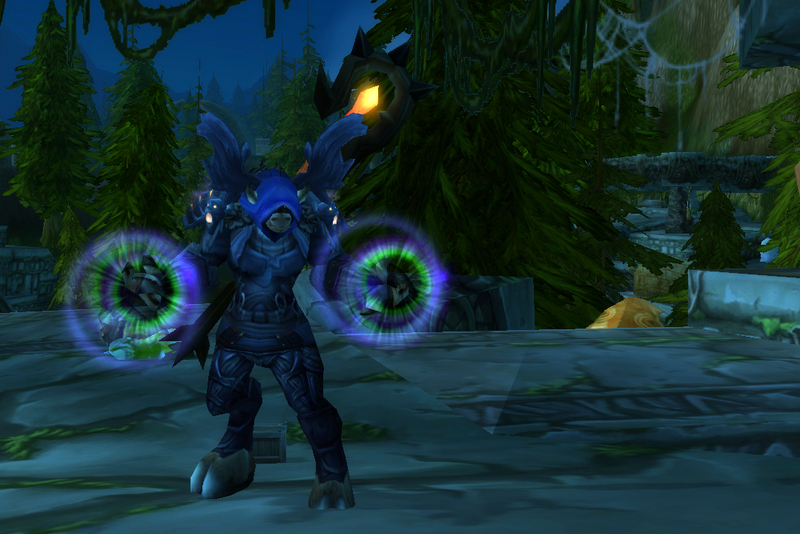 I recommend doing the Shadowmoon Valley Teron Gorefiend quest chain on all classes, for the T2 helm recolors. See it in a dressing room on WowHead here. I find I can’t really write about finding Norm, without writing about community. Even this post feels grossly unfinished without credits. For Cyn and Cynwise, who have been making a baffling parallel journey with me and Norm. For Cat, who sometimes knows my thoughts before I do. For Rades, for inspiration and trust, and for the Fajitas for being home. For Snack, for writing the post that made me realize what this post was meant to be, and for running the guild that made me realize Norm exists outside the community, too. Because the person I somehow want to thank is Normanitee. This digital avatar who doesn’t even exist, but does, because she is breathes through me. Norm is the nexus where Warcraft is not just a game. Where mechanics meet identity, where human connections that exist outside the game take action within digital spaces. I can be Narci, or even my real life identity online without her, but I cannot be Norm without being with this character. She’s the focal point where fun isn’t just what’s fun right now, time frittered in “a game”, but fun is a process. Fun can be a journey undertaken together, with uphill slogs and mile markers. There are times when you just grit your teeth and do this thing because you’re doing it together, whether it be together with your friends, or together with this pixelated cow who is somehow my friend, as well. She is a part of me that, through divorce with the rest of me, I can love myself the way I love others. Love isn’t love until it is shared, until it is actioned, given away and accepted back. It makes sense, perhaps, that I externalize this part of myself into an isolated, separate personality, item, locus. That it is far enough away from the me who is just me, indivisible, that I can respond to her the way I wish I could respond to myself. So really, when I say thank you to Norm for waiting for me, I mean thank you to myself, for giving myself time to grow. When I think that Norm has found a home, I know I mean I am more comfortable in my own skin, as well. And when I realized that Norm had found a way to move forward, what I know is that I, too, the rest of me, will find my way into a future I still haven’t imagined. Hi, me. I’ve missed you. Bravo. I love this post, Narci. And it’s so good to see you back on Norm again. As much as I love the moose hats for awesomeness/comedic effect, I really do love how integral they are to Norm’s personality (see: the possible outfits you threw together on Tumblr, all with varying moose hats), and how she gets grumpy without one. It really would be strange to see her without them. But antlers aside, I was thrilled when you brought Norm over, because I was excited you’d be playing “you” again. Not that I didn’t enjoy seeing BBNorm puttering around, but I knew what it was like to have your old main who you most strongly identified with “shelved”. Investing the RL money and emotional significance of moving Norm really signified, to me at least, a readiness and willingness to stride forth and start making new, fun memories on Norm. There’s so much I want to say, and all of it would be just an echoing refrain of what you’ve already written. This is beautiful, Narci. I’ve already spoken to you about this privately, but these thoughts of yours, these things you have come to realize: they are helping me learn to love myself, and to sift off years’ worth of pain and hurt (much of it self-inflicted, usually unconsciously). I thank you for that. I, we, me, these disparate parts of myself would not be approaching some sort of cohesive whole without all these parts of you. 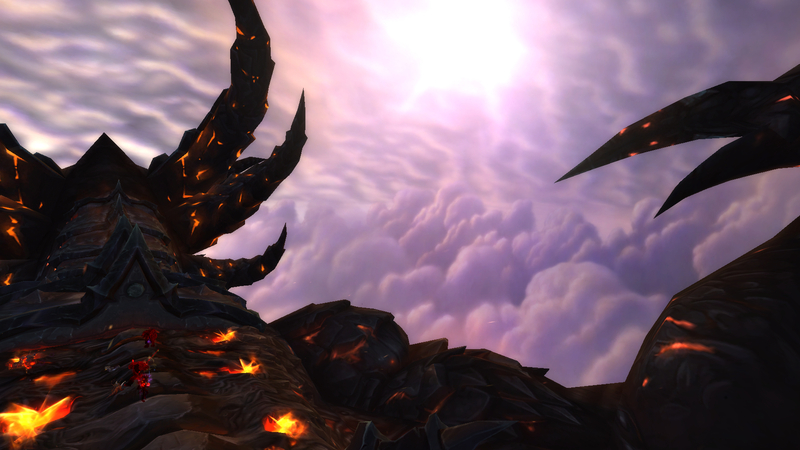 Thank you, for being my friend both here, and in Azeroth. 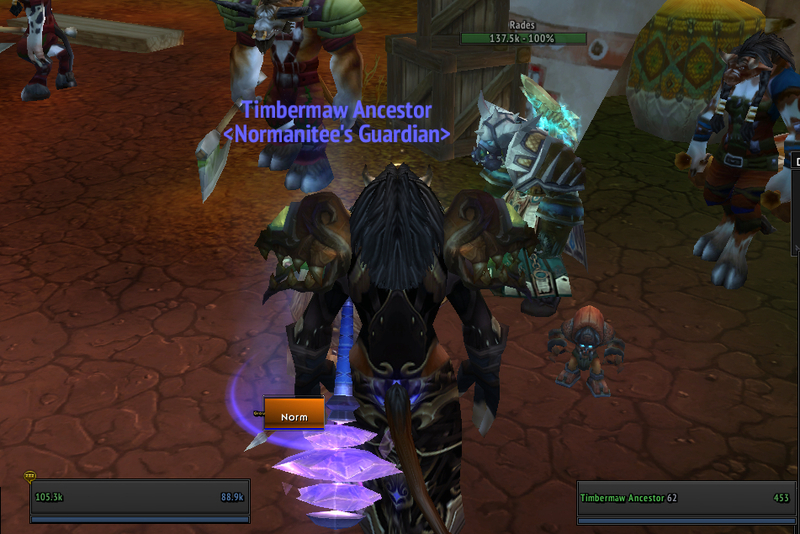 So here’s part of me wondering ‘who I am’ in game these days, and admitting that I have no idea. But that part’s confusing, so I’m just going to shout DIRE MOOSE instead.